Awesome Location! Waterfront Bungalow, Pool! BEAUTIFUL & METICULOUSLY CLEAN! WATERFRONT BUNGALOW, PRIVATE POOL, WI-FI! AWESOME LOCATION! Beautiful waterfront corner lot, minutes from Gulf, by boat! Bring your boat (or rent one) Catch fish off the sea wall or charter a fishing boat... Port Hudson Marina is just two miles away, near Get Hooked Bar & Grill, Fun Food! MANY Golf Courses all within easy driving distance, too! Come see Hudson Beach, just a short distance away... there, you will find public picnic areas/BBQ grills/playground/fine dining. Restaurants include Sam's Beach Bar! ~with a picturesque view of the Gulf! Just five miles (or less) you will find: Outback Steakhouse, Chili's, Carrabba's, Target, Super WalMart, Dillards, Burdines, Beall's, and many other great places! This charming bungalow has been COMPLETELY REMODELED! Ceramic tile was installed throughout the house as well as being freshly painted, and all new furnishings! No smoking please. Meticulously clean and attention given to detail! All towels, linens, are stocked and ready for your arrival! We have a weekly maintenance service for our swimming pool and lawn care! So you can just sit back, relax & enjoy! We have it all, just bring your suitcase! The Bungalow offers a spacious eat-in kitchen with new appliances/cabinets and countertops + fully stocked kitchen! The outdoors include a generous floating dock if you need to dock your boat, and a poolside deck with professional landscaping. Also, a well constructed observation deck that will give you beautiful view towards the Gulf! Enjoy lounging (or fishing) on this beautiful waterfront corner lot! Completely fenced in yard! BBQ Grill and 2 Kayaks available for your use! This property is adjacent to a protected bird sanctuary, therefore it is very peaceful and quiet, while spending time outside... maybe even taking a quiet nap in our poolside hammock! 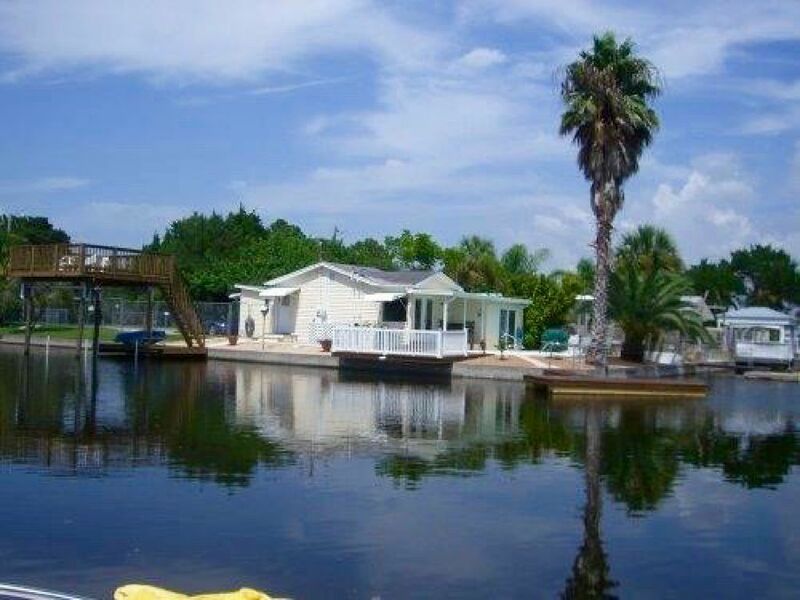 We originally purchased this beautiful waterfront property 2002! As Florida natives, we feel right at home surrounded by water in the Florida sunshine! We take pride in our Bungalow and hope you enjoy our cozy home away from home! Happy Vacationing! Private Neighborhood Boat Ramp! Dock your boat on our floating dock, with direct Gulf Access!! View of the Gulf of Mexico sunsets from our 2nd story observation deck! Corner Waterfront Lot on a canal, with Gulf access. Corner lot! Direct Gulf Access! Private use of Floating Dock! Private Boat Ramp at end of our Canal! Less than 5 minutes to the open Gulf! Free use of our 2 kayaks included with your stay! Land Line available. Free long distance to USA and Canada! Central Heat and Air. We also have A/C window units in each bedroom. Ample Parking. Room to park your boat trailer if you bring one! One Breakfast Table (in eat-in kitchen) seats 4 One Dining Table (in entryway) seats 4 (or 6) All 8 chairs are identical, and can be shared/moved to seat more than 4 people at the Dining Table. BASIC CABLE ONLY / HD TV BLUE RAY PLAYER FOR NETFLIX,ETC. PREMIUM CHANNELS JAN/FEB/MARCH ONLY. Basic Local Cable Channels Only. Except January, February & March... those Winter months include additional channel options. Poolside Outdoor Firepit on the deck to use during your stay! Iron, Ironing board, Hair/Blow-Dryer, Shower with large Tub, Private Pool, Patio Table & Chairs, Outdoor Lounge Chairs, BBQ Grill, Kayaks! Fishing Charters, Many GOLF COURSES!, Casino Boat!, *Boat Ramp at the end of our Canal! Our Bungalow is 1.5 miles from Bonati Institute! 15 minutes to Weeki Wachee! 15-20 Minutes to Tarpon Springs Sponge Docks! 45 Minutes to Busch Gardens! 1 1/2 Hours to Disney!